Vigilante Extreme Ziprider at the Shepherd of the Hills is a great place to visit if you want to try a thrilling ride experience with the zipline. Vigilante Ziprider is the longest zipline in Branson that offers exciting and daring thrill ride with spectacular views of the Ozark mountains. The starting launch of this thrilling zipline ride is on the open air deck at the top of the Inspiration Tower. Once you are harnessed in a zipline, you will be whisked away on a downhill ride over the 160-acre homestead of the Shepherd of the Hills. The zipline ride travels at a speed of 50 mph on a half mile stretch. The Vigilante Ziprider hovers above two hundred foot drop and will let you feel an exhilarating ride experience as it swings above the trees. 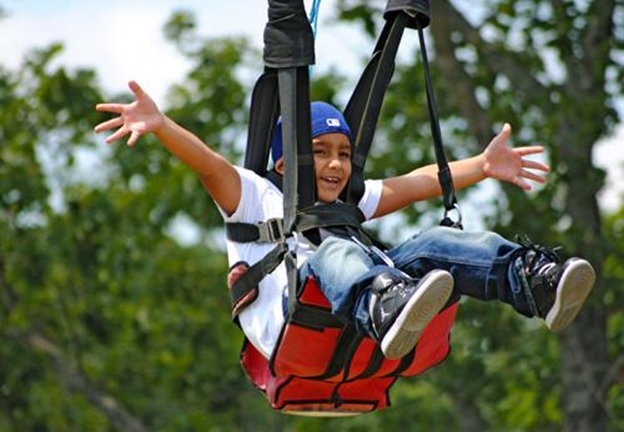 As the zipline thrusts you forward, you will find yourself flying like a bird over the treetops. As the cold wind whips your face, you will see below fascinating views of the natural scenery of the Ozarks including beautiful trails, barns, and occasional animals. Vigilante Ziprider was named after the Baldknobbers (a group of vigilantes) who lived during the 1800s. The Baldknobbers was formed by the vigilantes that time to protect against lawless elements in the Ozarks. But unlike other vigilante groups, they became a group of lawless elements and they pursued unlawful activities that ranged from robberies to murder. The infamous vigilante group of Baldknobbers played a pivotal role in naming the ride with Vigilante Extreme Ziprider. The Vigilante Ziprider offers four ziplines ideal for all ages which all start on the same launching area at the top of the Inspiration Tower. As the zipline gets ready for launching, the riders will sit in a special carriage that resembles a carseat. The design of the carriage is adjustable to fit riders with weights from seventy-five pounds to two hundred seventy five pounds. The Vigilante Ziprider does not conduct orientation before the launching of the zipline. The trained attendant will simply strap the rider into a harness and when the launch pad gate opens the rider will start to fly. The patented Ziprider controls the speed and brake system of the zipline, which means that the riders will just have to relax and enjoy the ride. Unlike traditional ziplines, the Vigilante Extreme Ziprider is more than just a ride with comfortable sitting. With the traditional zipline, the harness that holds the rider has to be reset after every run. But with the patented retrieval system of the Ziprider, the seats are brought back up to the tower with the push of a button. This zipline has the highest starting point at 203 feet on top of the Inspiration Tower. Flying with the Vigilante Extreme Ziprider will only cost $28.64 per person per ride with extra charge of $20 for additional ride. So, if you want to try a thrill-to-the-bone zipline ride experience, visit the Vigilante Extreme Ziprider at the Shepherd of the Hills in Branson.